Well this post covers the planned observation of one of the recurring Algol eclipses and whether or not the weather would cooperate. The weather certainly interfered with my planned practice sessions and I only had one chance to practice since my last feeble attempts to find an opening in the night clouds to even see any stars. Remember the plan was just to use the camera and tripod to take images for light curve analysis. 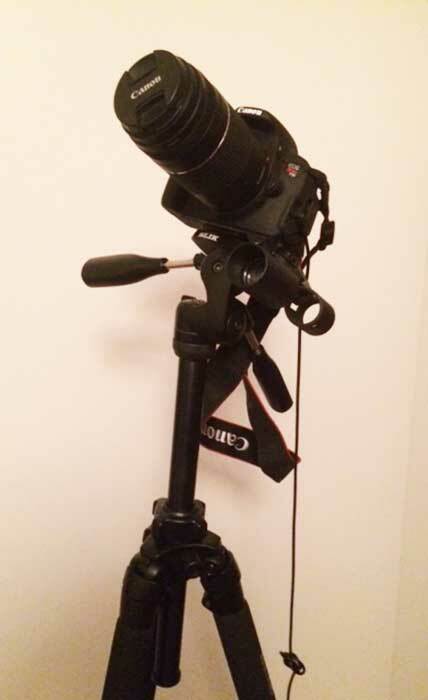 The camera/tripod combination is easy to carry outside and it only takes 5-10 minutes to setup, identify Algol's position on the night sky, take one or two images at different exposure settings and go back inside to get warm, and it has been really cold outside now. Remember also, since I am just using star hopping to find my way around the night sky, it is necessary to be able to point the camera at Algol and use a wide enough field of view so that even with inevitable pointing errors, Algol will still be found in the image. To that end, I changed from using my 150-600mm telephoto lens to the smaller 75-300mm lens. The picture below shows what this setup, with the red dot finder also attached to the camera. On the one rain and cloud free night earlier in the week, this image of Algol was made with 75mm lens setting. 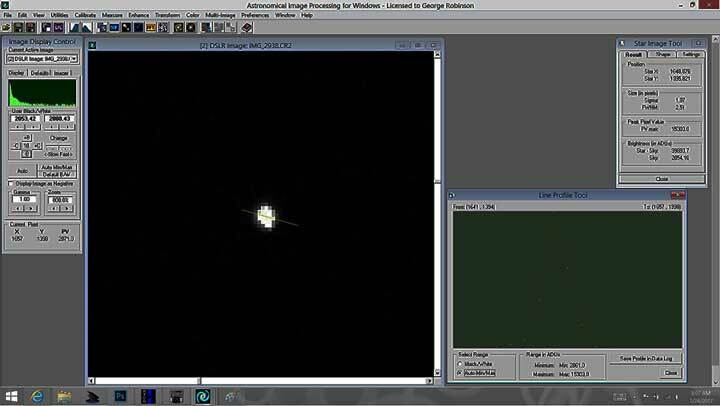 This setting is just 1/2 of the previously used 150mm focal length setting so that the wider field of view will increase the chances of finding Algol in the collected image. I move the camera pointing angle so that the red dot finder points right at the selected location. Knowing where to point is still somewhat problematic because Algol at its minimum magnitude will be hard to see with all of the light pollution here at the observatory. Anyway, the following test image was made for Algol when it is at its maximum magnitude of 2.1. Verification that the identified star is indeed Algol was made with analysis provided by uploading the image to Astrometry.net, where the camera frame center of field of view was determined to be pointing at RA = 03 01 05 and Dec = +44 11 52, and catalog position of Algol is reported at RA = 03 08 10 and Dec = +40 57 20. The camera field of view at that focal length covers 11 x 16.5 degrees. So, luckily for me, the selected camera field of view was wide enough that Algol was still in the frame. Whew! I still need to work on improving my pointing accuracy. Note that the total light collected in the all the pixels around the star image is, Star - Sky = 99,893, and the maximum pixel value of over 15,000 indicates that at least one pixel is saturated with too much light. T Look at the star profile and note that most of the pixels are not saturated. What we do learn from this test image though is that 2 seconds is too long of exposure for the 75mm lens setting. A better compromise for the upcoming eclipse data collection will be to use a 1 second exposure setting. So, while waiting for the rain to go away for the next practice session, Astronomer Assistants Ruby and Danny were complaining about having to walk around on the observatory grounds with all of the rain. 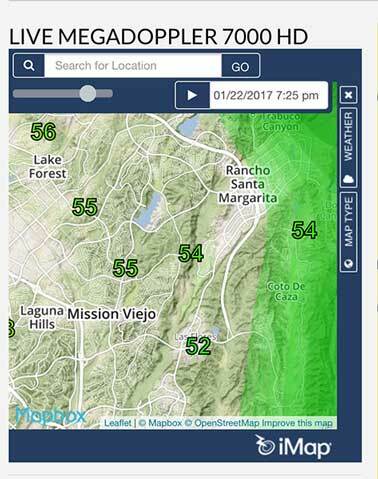 To help meet their needs, I discovered a great app that displays the rainfall in your area as measured by the KABC Doppler 7000 radar. See a typical image of rain pattern below. The screen is updated every 5 minutes and I could watch the edge of the rainfall slowly move by and could almost predict when to get the Assistants ready to go outside. You can zoom in and see street by street view of the edge of the rainfall. Pretty neat free app! So, now we are all good to go with the eclipse data collection plan, which was going to start at about 7:00PM on January 24 and go on past the eclipse minimum time expected at 2:24 AM on January 25. Well the weather was not cooperating and from around 7:00PM to 9:00PM the clouds were just not going to go away. I gave up! Another observing plan bites the dust! But, a little bit later, when I was out with Astronomer Assistants Ruby and Danny on the final tour around the observatory grounds, I noticed I could see Orion, high overhead and all major stars were quite visible. Then with my trusty IPhone goSkyWatch app, and the thinning clouds, I could locate where Algol should be and yes, there was a dim star visible there, offset to the left from my guidepost stars, Capella and Mirphak. 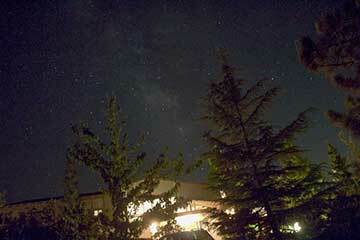 So, I dutifully grabbed the tripod and went outside every hour from 10:00 to 1:00AM to take images of Algol. It was so cold outside and I was only outside about 10 minutes for each exposure. I wore my gloves, with the finger tips cut off, so that I could work the touch sensitive camera screen. It was still very, very cold. Also, when I came back inside, I was at risk of falling asleep and decided that I might have to set an alarm to go off every hour to keep me going. From about midnight on, it was becoming more difficult to spot Algol. At 1:00AM I could not see it at all and just had to just where to point the camera in relation to the line between Capella and Mirphak. Then the clouds came back and I could not see any reference stars and decided it was time to call it quits, for the second time, and that was the last image taken. Then, as all amateurs know very well, another complication often turns up and when I tried to download the camera images to the PC for further processing. The PC complained that there was no disk space available for download. How can a PC with 115 GB of disk space and only about 15 GB of pictures, be out of diskspace. Well, it turns out that Windows itself takes up a lot of space, but the real culprit seems to be something called "OneDrive", which took over 50GB. OneDrive is some sort of disk backup tool and I'm not quite sure yet what can be deleted and what it is best not to delete. Anyway, now I have to spend time to resolve what to do about this new problem. Amateurs will realize that this is just the lot we are faced with. Always some new lesson to learn so that these gotcha don't get you down! So, until I get my PC disk space issue resolved, I won't be able to do the light curve analysis and see if we can see the beginning of the eclipse. I'm also busy packing my bags to fly to Washington, DC this week to attend the American Physical Society "April" meeting. This time the April meeting just happens to take place in January, for some unknown scheduling reason. I always like to get to DC, but really, in the winter?. At least, I will have the chance to meet up again with Searching for Gravity Waves, Dr. Gary. See you there Gary! But, one final thing for this post, I wanted to mention an interesting celestial object that was mentioned during the video lectures at the OCA Astrophysics SIG meeting. Likes to Hike, But doesn't bring a telescope and SIG leader, Robert, showed two video lectures, one lecture, "The Star Factory: Inside the Eagle Nebula", by Professor David Meyer, in which the dark clouds, called Bok Gobules, were discussed. They are dark clouds that obscure any star light from behind them and are close enough to Earth that there are hardly any stars in front of them. Now we all like to observe other clouds of gas, such as planetary nebula and supernova remnants, which are glowing after being excited by nearby stars. 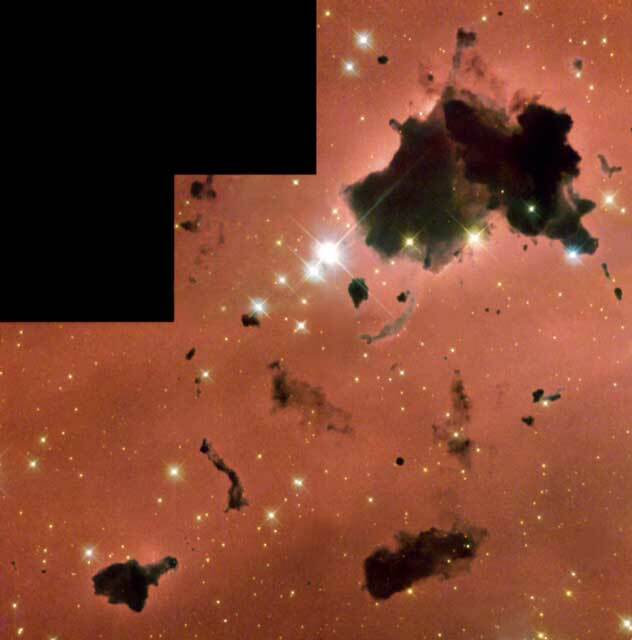 But the Bok Gobules do not include star forming regions and appear very dark. I had not heard of these clouds before and wonder if any are visible to amateurs, without access to the Hubble. The gobules are quite close by as indicated by the lack of stars in front of them. Thank you Robert! So, that is enough for now. My plan is to resolve the PC out of disk space issue and then tackle the analysis of the four additional camera images, which hopefully will contain Algol, and thereby get our first light curve showing the early beginning of the Algol eclipse.